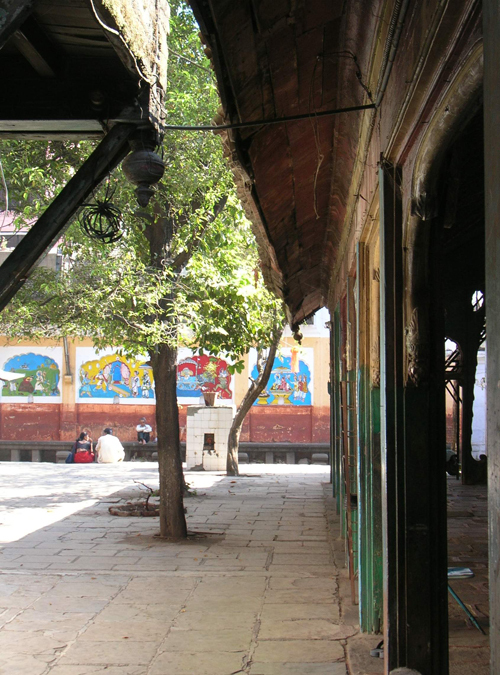 Located in the heart of Pune city in Maharashtra, India, is this popular introverted and pedestrianized shopping precinct called Tulshibaug, which represents the quintessential historic (built 1765-98) and architecturally unique Peshwa period heritage of Pune, the focus of which is the Ram temple. One of the finest examples of Peshwa temples in Maharashtra, the Ram Mandir is made of dressed Basalt stone with a vaulted shrine topped by a spire. 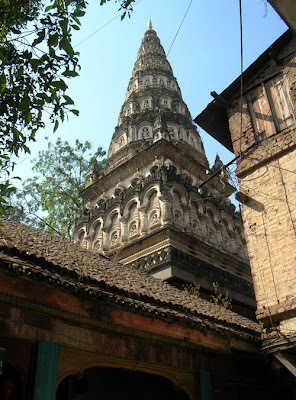 In 1884, additions and alterations made to the temple included a very elegant new conical Shikhar (spire) ornamented with figures; foliage, niches and the third hall or Sabhamandap (60’x40’x20’), which was rebuilt in massive wood. The Tulshibaugwale family, the founders of the temple complex, have been instrumental in promoting the conservation of the complex. Ar. 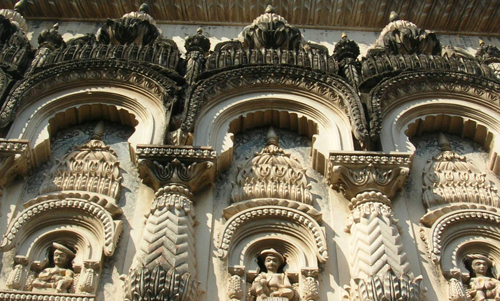 Kiran Kalamdani in association with structural expert, Ravi Ranade and with adept woodworking solutions by Madhu Chilwant and stone masonry by Hiralal Pawar are diligently working on the conservation and restoration process that has been initiated in 2006. 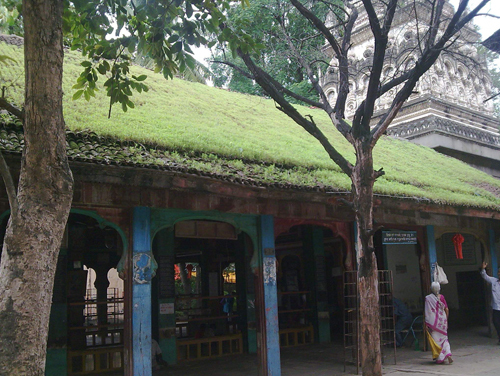 It is proposed that a semblance of the original scheme of the complex (which also houses Ganesha and Shiva temples) be re-established; one which sported water fountains, several large water tanks in and around the temples and a beautiful yard of flower beds laid out in front of the main temple, which had paved footpaths crossing them, leading to the other two temples in the precinct. A very unique and exemplary fact is that the entire construction of Ram Mandir is in timber and dates back about 214 years. The process of conservation began by repairing and cleaning the deteriorated sloped roof and restoring the damaged roof members. 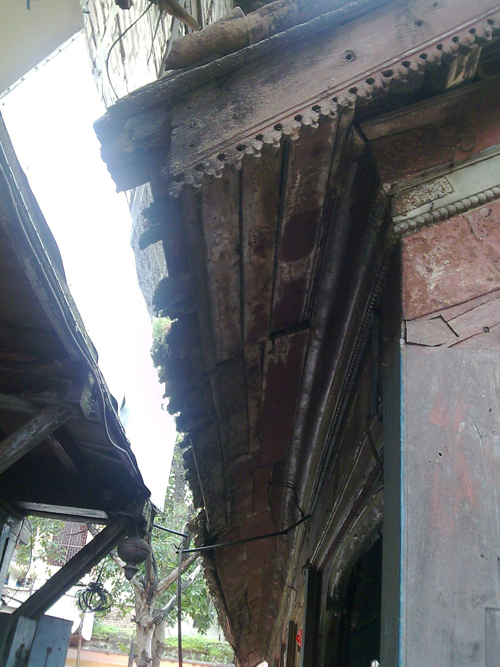 The sloped roof of the main temple had overgrown vegetation and broken pot tiles strewn over deteriorated members. Due to this weight, cracks were found on the decorative elements such as wooden arches and carved ‘jalis’ (decorative wooden trellis). 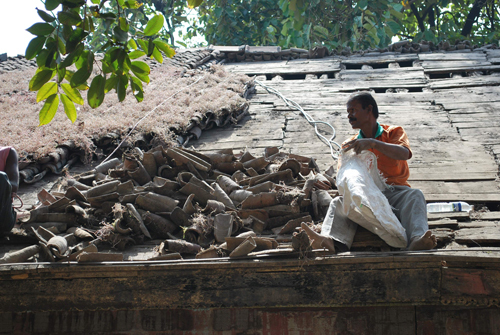 As part of the conservation measures, the entire roof was dismantled and the roofing members checked for damage and deterioration. The mezzanine above the Sabhamandap (Main Hall) was also cleaned. Roofing members such as boarding, eaves board and parts of the false ceiling were replaced wherever necessary. New G.I. Sheets and ridge pieces were provided over the repaired and cleaned roof structure. New pot tiles will now be laid over these on teakwood battens. 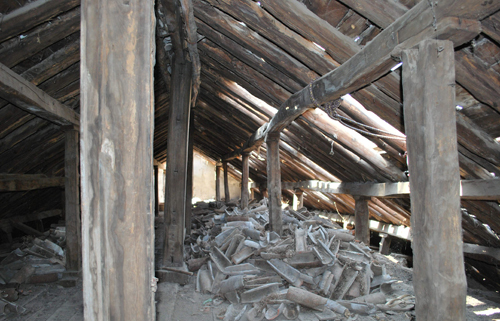 Old wooden purlins had been placed very closely, causing excessive weight on the columns. As a solution, only good quality wooden purlins were separated, and placed over the GI sheets, thereby reducing the heavy weight over the wooden columns; the entire roof became very light after restoration and cleaning. 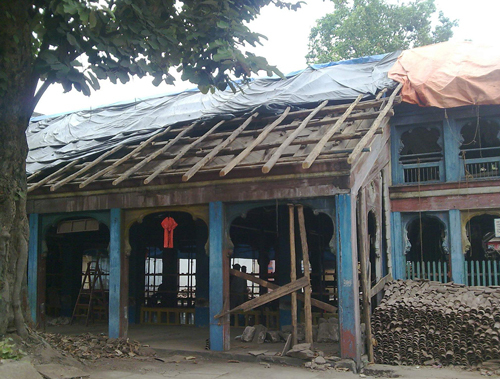 One of the major conservation measures taken up was to correct a major structural defect in the main temple, which was the absence of a masonry foundation for the exterior teakwood columns. At the time of the initial construction, the ends of the exterior, load-bearing columns were inserted straight into the ground up to a depth of 2-3 ft., and not into a masonry footing as per standard practice. Therefore, over time, these column ends, being in direct contact with the surrounding earth and rising moisture, began to decay upwards. Structural integrity of the superstructure was threatened, as there was no permanent hold to transfer load and counter movement. Column bases in basalt stone have hence been installed, as they would provide a strong key for load transfer and prevent further decay of the teakwood columns. They are carved in a style typical of the building. 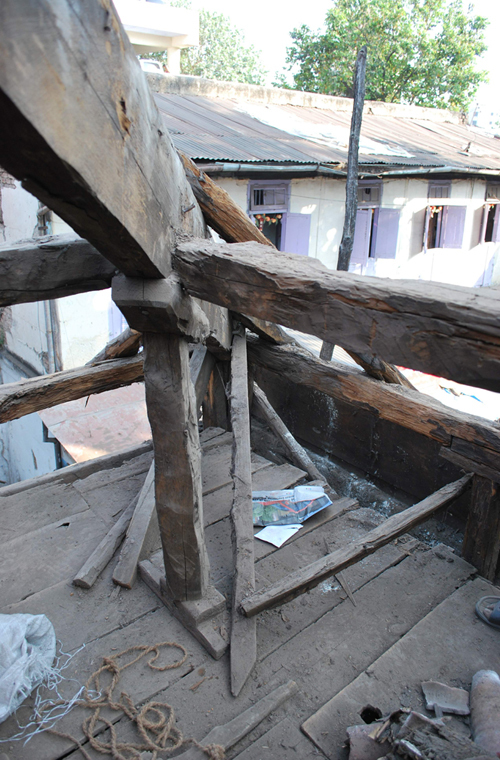 Alongside, structural conservation of wooden columns is also being carried out. 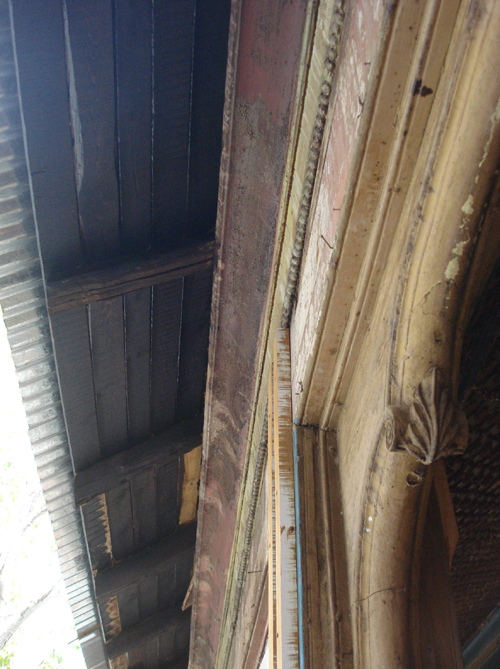 Several wooden elements in the structure necessitate cleaning. Applied oil paint is being removed from old woodwork such as interior and exterior faces of columns, arches and moldings. This will now be replaced with the more compatible ‘Bel’ Linseed or ‘Kaju’ (cashew nut shell) Tel (oil) with added natural preservatives or staining agents. Simultaneously, special attention is also being paid to restoring the iconography and details. Elements such as the finely moulded spire in stucco, the delicate, exquisite stonework and woodwork in the columns, arches and false ceiling and the thresholds, and other artifacts in beaten silver - all part of the historic and cultural heritage, and reflective of the material and craft traditions of the era have been identified for conservation. Other proposed measures to be taken up shortly include restoration of the original Basalt flooring, wherever necessary, removal of oil paint from the stone surfaces on the temple interiors, and cleaning and restoration of the Ram Mandir Shikhar. The planning of this temple complex reflects the introverted, campus style of planning prevalent 300 years ago. Today’s urban fabric has therefore acquired the unique distinction of a social and religious space enriched by heritage architecture, sculpture, painting and iconography. And all this in the midst of the precinct being one of the most preferred feminine shopping hubs in the urbane city of Pune. Great project...I would love to have been a part of this restoration team. 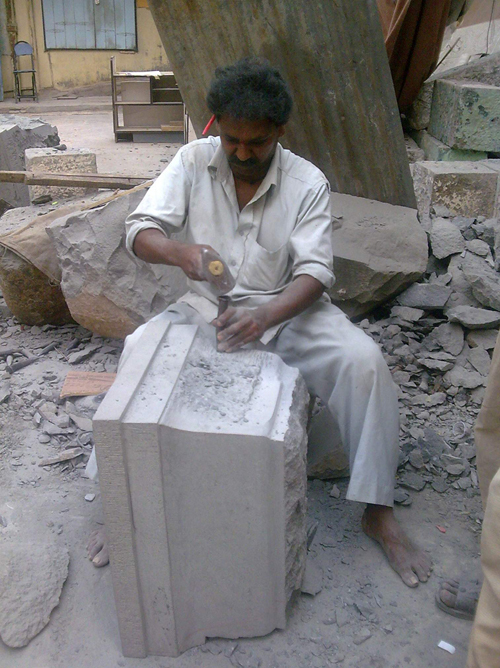 Seeing centuries old craftsmanship still being practiced is a very exciting and rewarding experience for an architect. Definitely a tremendous architectural and cultural learning experience for all those involved.